How tired are you of the 2016 presidential election? Tired enough you'd prefer the end of all humanity to either of the candidates? In a new survey from UMass Lowell and Odyssey reports that almost a quarter of millennials would prefer to perish in a massive meteorite strike than see Hillary Clinton or Donald Trump take up residence in the White House. Do they genuinely want a massive meteorite to strike the Earth? Let's say no. But the fact that so many people responded to the survey this way says a lot about how people feel about the election. The poll asked millennials to pick their preference between a Hillary Clinton presidency, a Donald Trump presidency, a random lottery to choose the president from all citizens, Barack Obama giving himself a lifetime term as president, and a giant meteorite striking the Earth and "extinguishing all human life." 39 percent of those surveyed opted for Obama's lifetime term, 26 percent said they liked the lottery option, and 23 percent preferred that humanity meets its doom. Maybe this is what happened to the dinosaurs. They had an election that so divided their dinosaur nation, they voted en masse for extinction via space rock. 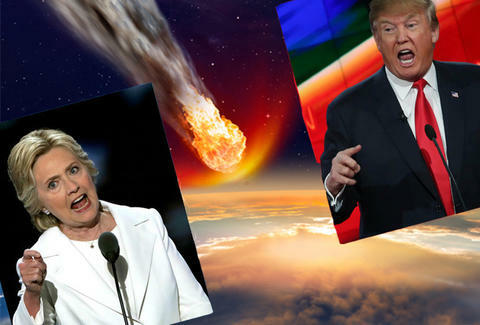 "We do not take our respondents at their word that they are earnestly interested in seeing the world end," said Joshua Dyck, co-director of UMass Lowell's Center for Public Opinion, "but we do take their willingness to rank two constitutional crises and a giant meteor ahead of these two candidates with startling frequency as a sign of displeasure and disaffection with the candidates and the 2016 election." In more substantive results, they found that millennials who are likely voters prefer Clinton to Trump by a 3-to-1 margin in a head-to-head race. 12 percent of respondents were undecided. When third-party candidates were included, 61 percent responded Clinton, 22 percent said Trump, nine percent said Libertarian Gary Johnson, and five percent said Green Party candidate Jill Stein. The remaining three percent remained undecided and probably asked what happened to that option involving the meteorite. The election is rapidly approaching, with Wednesday seeing the final presidential debate. It remains to be seen if "giant meteor strike" can make headway as a write-in candidate before then.